Talk about a trigger happy day, first we get a Nikon D4 leak, then the Fujifilm X-Pro1 camera leak and now somebody pushed the button on Sprint’s Samsung Galaxy Nexus LTE ad a little too early — full review of the Galaxy Nexus here. The 4.65-inch Super AMOLED HD display, Android 4.0 Ice Cream Sandwich smartphone has appeared in a flash ad on CNET’s website and the people over at Engadget managed to snap up a few screenshots of the ad before it disappeared. It’s interesting to note that in the advertisement, the smartphone’s TI OMAP 4460 processor is shown to be clocked at its maximum 1.5GHz rather than the battery saving 1.2GHz as in the Verizon LTE and HSPA+ versions. 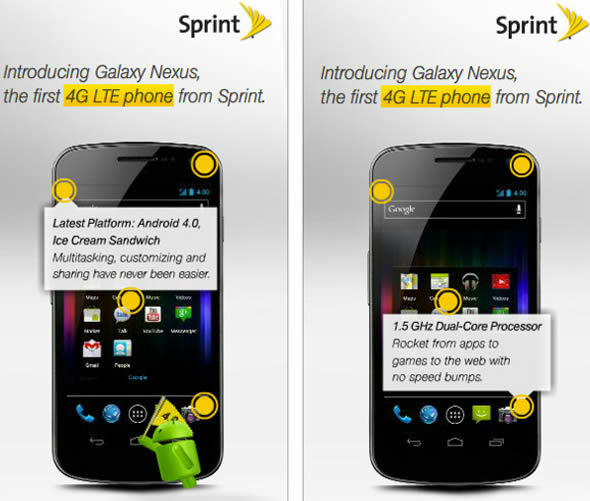 The Galaxy Nexus will become Sprint’s first LTE handset as the carrier will turn on the lights to its 4G LTE network in the first half of the year. Having the LTE network as prerequisite, don’t expect the Sprint Galaxy Nexus in the following few months.